“Last year, Closeup organized the world's first crowd-sourced music festival, asking an audience through social media to choose what they wanted to see during the event. We weren’t too sure if we were going to do it again this year, but because the crowd asked for, here we are,” said Gem Laforteza, Senior Brand Manager for Closeup. “We asked what the people wanted and people were pretty much split on whether to have EDM acts or Indie acts at Closeup Forever Summer,” said Apples Aberin, Unilever’s Head of PR. “After seeing the results, Closeup has decided to take it to the next level, by combining indie and EDM in one music festival." Here's an exciting news!!! OMG I'm so exciteeed. Okay...to headline the EDM night is... tentenenen... MARTIN GARRIX!!! One of the best and youngest DJs in the world, Dutch DJ/Producer Garrix will take the stage on May 16 at the MOA grounds. Ranked #4 in the world by DJ Mag, Garrix is best known for his track “Animals,” which he released when he was only 16 years old. He is currently set to release an album, collaborating with industry big wigs like Usher, David Guetta, Tiësto and Ed Sheeran. Prepping the EDM crowd for Garrix is the breathtaking DJ Eva Shaw, formerly known as Bambi, resident DJ at Hakkasan who has performed in international music festivals including Ultra Miami. And completing the line-up are sought-after local acts: Sinyma, Autotelic, DJ Nix Damn P with Motherbass, and rising young artist BP Valenzuela. "As this year's Closeup Forever Summer promises indie acts in the afternoon and EDM in the evening, it’s perfect that Closeup can get you intensely close with intense fresh breath from day to night," said Closeup Brand Ambassador Coleen Garcia. Here's my Forever Summer kit!!! Love it! But, here's some good news!!! There’s a discount on the tickets if you get closer and buy them in pairs. The more the merrier! 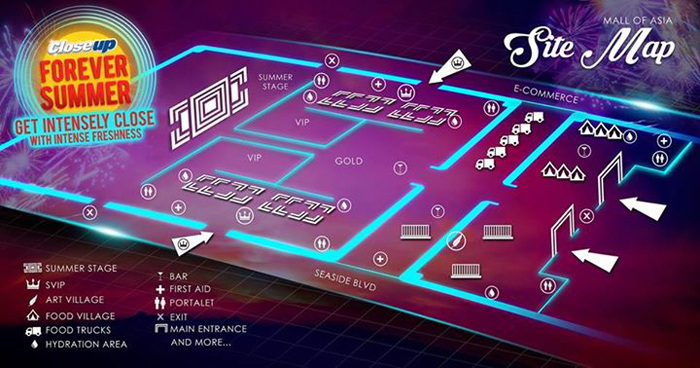 You can get two (2) VIP passes for only PHP6,500 and two (2) VIP passes for only PHP4,000.